Congratulations to Alma Graham for her winning quilt square which has been sent to National to become part of the National Grange quilt. There will be another contest this year and the details of the design and color scheme will be forthcoming. 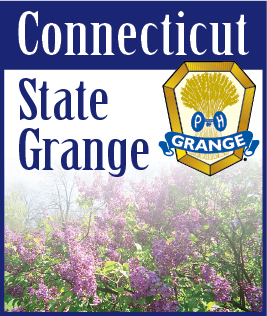 Also, this coming year for National Grange Session to be held in New Hampshire, they will be collecting hats, mittens and scarves. Now is the right time to be looking for these items, and especially after the season discounts. Let’s show them the old CT Spirit of giving. The new, corrected recipes have been sent to the Pomona CWA chairmen for distribution. Basically it is just eliminating one of the 1/4 cup sugars (should not have been on the recipe). I hope that everyone has fun with this year’s theme.